I have been wanting to do an album about My Favorites for a long time. I finally put the finishing touches on it last week and am delighted with the results. 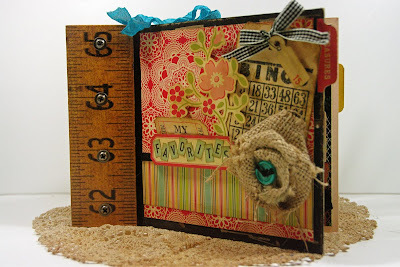 I used October Afternoon Thrift Shop Papers and fun vintage inspired embellishments. Some of my Favs are Listening to beautiful music, Creamy Vintage Buttons, Sitting on the sidelines watching my children, Growing old together, to Looking for that perfect dress form that will one day be mine. If you are interested in purchasing My Favorites Album Kit it will be available to purchase soon from The Scrappy Gourmet. You are my favorite friend:) P.S. The album is really, really wonderful! Wow Sheila what a fabulous album! I love the retro style typewriter phone and camera images and the lettering! What a great idea! The photo holder in the post below is so cute! loving it. I really hope you do well with this.